You’ve heard it a million times before – it’s not the heat, it’s the humidity. Excess humidity can have a big impact on your home’s comfort. Wipe out that clammy feeling. Get rid of indoor stickiness. Say goodbye to musty odors. Revolutionary WHOLE HOME dehumidification technology from Aprilaire. Removes just the right amount of moisture for ultimate comfort and peace of mind. And it works throughout your entire home, not just in one room like noisy, messy portable dehumidifiers. In addition, it lets you dehumidify a separate area of your home where there is more humidity buildup – like your basement or crawlspace – even when your heating/air-conditioning isn’t running. Today’s energy efficient homes need Humidity Control! More efficient air-conditioning, better vapor barriers, better insulation – all these advances can result in excess moisture in your home. And when you try to use your air conditioner to remove this excess moisture, you’re really only making your indoor environment uncomfortably cold. Today, the best answer is the Aprilaire whole house dehumidifier. Better control of molds, mildews and dust mites – too much humidity creates an excellent breeding ground for hundreds of types of molds, mildews and other home invaders. 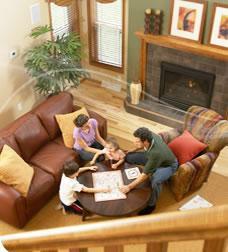 This unit helps control these causes of family allergies and home structure deterioration. Total comfort – automatically senses moisture levels and maintains optimum humidity levels in your home, running only when needed. Higher capacity and efficiency – has three times the moisture removing capacity and offers 50% more water removal per kilowatt hour than even the best portable dehumidifiers. Low maintenance – automatically manages moisture based on your changing conditions. No need to constantly adjust settings or empty tanks. Automatic switching – can switch between whole-home and localized (basement/crawlspace) dehumidification automatically. Localized Control – with the Living Space Control, you can override the main control sensors, permitting you to manually monitor and control moisture levels in a specific location (e.g. master bedroom). Improved ventilation – optional, built-in ventilation and fan cycling delivers fresh outside air when your home needs it most, improving indoor air quality. Works well in new or existing homes, with flexible installation options to fit your needs.